A lady’s bag can be a scary place. Most guys I know wouldn’t dare look into a lady’s bag, preferring instead, to pass the bag to it’s owner for her to rummage through if he wants something from it. My bag is a private space. I only let my closest friends poke through my bag and only with prior permission. When I read about the “What’s In My Bag?” bloggers’ colab, my immediate thought was “Oh gawd, what IS in my bag?”. Funny enough, I have owned this bag for just over 24 hours. I haven’t had time to mess it up. It appears that I kinda like the colour red. OK, fine, I might have an obsession with the colour red. My $25 red canvas bag died a few weeks ago and on Thursday, I ordered a new bag from Oh My Bag. Oh My Bag is a Christchurch-based online store that sells affordable leather bags in a carefully curated range of styles. They offer free shipping and are having a pre-Christmas sale: 20% off all stock. I couldn’t resist their Riot bag in red (also available in tan) at a bargain ($135.20NZ) so I treated myself to a Christmas present. 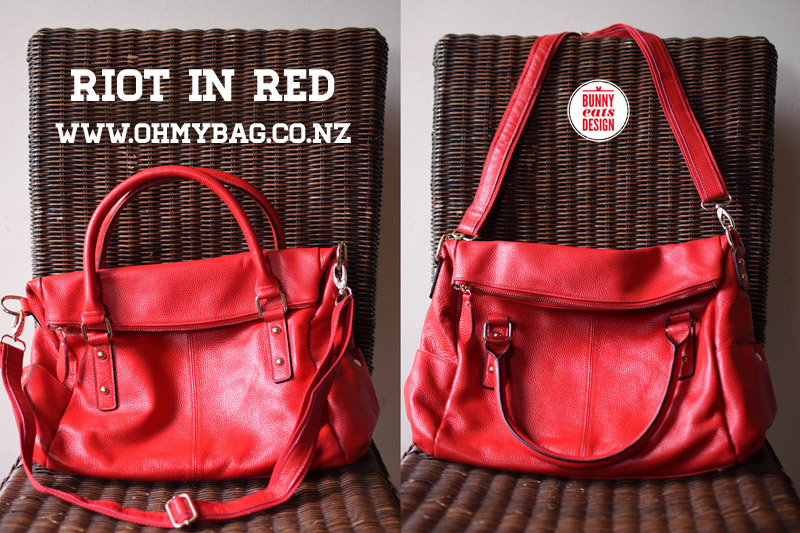 Riot bag in red from http://www.ohmybag.co.nz. Left: strap down/handles up, Right: strap up/handles down. My bag arrived the very next morning! I was super stoked. It is a great design, the perfect size for carrying all my stuff and such a beautiful colour. If you remember my lengthy post on leather bags, you might remember I’m CRAZY about pockets. This bag has seven pockets: 2 outer slip pockets with magnetic closure, 1 large outer zip pocket and 4 pockets inside the main compartment (2 slip, 2 zip). I haven’t figured out what I’m allocating all these pockets to yet, but I love the challenge. I’m excited to share this collaboration with bloggers from #brunchclub, a member’s only Facebook group of New Zealand bloggers. Jessica from J&J blog came up with the idea where we all post the contents of our bags at the same time, so if you like being nosey about what other people keep in their bags, be sure to check the links to other bloggers participating below. I hope you enjoyed this bit of handbag voyeurism! Tagged with: bags, bloggers, leather, What's In My Bag? Absolutely love the colour theme in your bag, everything looks perfect! Gorgeous bag, I am also a pocket addict. Red red red – love it! Awesome post, have had such fun checking out the bags. Looove the bag a new handbag was on my Xmas Wishlist fingers crossed it’s as cute as yours ! Your bag contents tell me you’re a practical person (?) Love that Flash flash drive! May I ask where you got it from? Thanks, I think? I wonder how much you can tell about someone by the contents of their bag? I love the Flash flash drive too. I bought him and his friends off Trade me. We also have Spiderman,Batman and Captain America but The Flash is the funniest. Mine holds a bit more than yours though…. I LOVE all that redness, you’re my red hero! I used to use lots of red stuff and have sort of forgotten over the years but am slowly getting back into the dynamics. Maybe a red bag is what I need. And a red wooly hat for winter 🙂 Big question now. How do your carry your camera around, in a case in your bags? Yes! 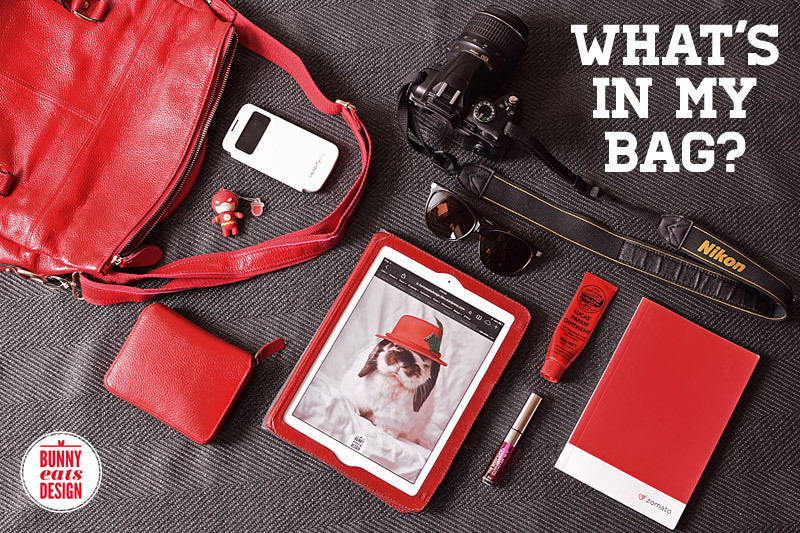 You need a red bag and a red hat…maybe even some red winter boots! I’m a bit naughty with my camera, I just put the lens cap on it and chuck it in my handbag along with everything else. If I’m being careful, I throw in a scarf or a cardigan for extra padding. I have a camera bag, but I found it was impractical for the other stuff I wanted to carry (it fits some cards, but not a phone) and I’m not a girl that carries a camera bag and a handbag. My lens cap is tight. It never knocks off. The thing I am most scared of is liquids. So I never carry drinks in my bag. Good point there about the liquids! I don’t even look in my wife’s bag… those things are hella scary!! You’ve inspired me. I also love red, esp red purses with various sub-purse accessories. I love bag shots. They’re so revealing but also aesthetically interesting.